(21250, Oklahoma Historical Society Photograph Collection, OHS). (22675.5, Mrs. Weldon Blevins Collection, OHS). (23163.222, Austin Album Collection, OHS). After treaties with the American Indians and federal legislation opened up Oklahoma lands for settlement between 1889 and 1906, agriculture developed very rapidly. Although the Indians in eastern Oklahoma had done some farming, mainly by leasing their lands to white tenants, farming in Oklahoma did not become very important until after 1889. Following the Land Run of April 22, 1889, when thousands of people rushed into the Unassigned Lands, agriculture moved swiftly toward becoming the basis of the Oklahoma economy. As the president of the State Board of Agriculture wrote in 1907, "agriculture is, and will be for years to come if not forever, the leading industry in our State." His prediction was partially correct, because agriculture was the state's leading industry well into the twentieth century. The pioneer settlers who pushed quickly into Oklahoma Territory to establish farms on free or cheap land did not have an easy time. Confronted by periodic droughts, low prices for crops and livestock, lack of capital, and other problems, they struggled to get a firm foothold on the land. Many of them initially lived in sod houses or dugouts and provided most of their own subsistence by growing garden vegetables, milking a few cows, butchering their own meat, and raising a few acres of corn. Times were so difficult and farmers so desperate in 1891, because of the severe drought in parts of the territory, that the railroads provided some seed grain so farmers could plant a crop. Despite the hardships endured in the early years of settlement, the federal census reported that between 1890 and 1900 the number of farms increased from 8,826 to 108,000. By 1910, when the census was taken after statehood, the number had jumped to 190,192. Of this number 13,209 farms were operated by African American farmers. In fewer than twenty years the area that became Oklahoma added about 180,000 farms to the nation's total. This was one of the most rapidly settled agricultural frontiers in American history. After 1910 the number of farms in Oklahoma remained about the same for a generation, between 190,000 and 210,000, until a steady drop began in the late 1930s. Oklahoma farmers produced a wide variety of crops including corn, cotton, winter wheat, oats, milo maize, potatoes, sweet potatoes, peanuts, broomcorn, cowpeas, alfalfa, wild hay, and others. They also produced and sold poultry, eggs, cheese, butter, and garden and orchard products. The main crops by acreage and value, however, were corn, cotton, and winter wheat. Corn was an ideal crop for a largely self-sufficient family in the early years of settlement. It was easy to raise and was valuable as both a feed for livestock and food for the family table. A farm wife could prepare grits, cornbread, and other foods from cornmeal, ground at home or at a local mill. Most farmers planted some corn, and by 1910 more than five million acres were grown. This was more than twice as much as any other crop. Cotton was Oklahoma's leading money crop, and production increased rapidly after about 1900. A decade later cotton farmers produced 923,000 bales on 2,324,000 acres. In the first decade of the twentieth century cotton growing was concentrated in central and southwestern counties of the state. In 1907 Lincoln County had thousands of acres of cotton, and some was grown in Woodward and surrounding counties. By 1910 Oklahoma ranked sixth among the cotton-producing states with a crop value of $61.8 million, as compared to the value of the corn crop of $47.8 million and wheat of $22.2 million. The growing emphasis on cotton, however, raised serious questions among some of the state's leaders because of the system's effect on farm families. J. P. Connors, president of the State Board of Agriculture, wrote in 1908 that by concentrating on cotton, instead of diversifying their crops and raising livestock, farmers became trapped in a destructive credit system. As early as 1910 some 54 percent of Oklahoma farmers were tenants, and tenancy was even higher among cotton farmers. The rate was highest among African American sharecroppers. Connors did not advise against planting cotton but urged farmers to diversify and raise as much of their own living as possible. Representatives of the newly established agricultural college at Stillwater (Oklahoma A&M, now Oklahoma State University), directors of the Agricultural Experiment Stations, and editors of farm publications were among others who urged farmers to diversify their operations. Farmers were advised to attend conferences and institutes to gain better knowledge of how they might improve their income and of how farm wives could increase their contribution to the family welfare. For example, in 1916 the U.S. Department of Agriculture (USDA) reported that farm women in Bryan County experienced greater success in dairying and raising poultry under the guidance of a home demonstration agent. Despite the effort to better educate farmers and improve life on the family farm, many farmers were either unwilling or unable to make the recommended changes. This was especially the case in locations where cotton was the principal crop. By the eve of World War I Oklahoma farmers had established an agricultural pattern that would persist for another generation. Wheat growing rapidly expanded in the central and northwestern parts of the state while corn acreage steadily declined. By 1920 only a little more than half as much corn was planted as in 1910. Wheat acreage, on the other hand, more than doubled in that decade. As farmers pushed farther west into the drier parts of the state, especially the Panhandle, where rainfall averaged less than twenty inches annually, they planted more drought-resistant sorghum crops such as milo maize and Kaffir corn. By 1920 the average size Oklahoma farm was 166 acres. However, there were huge variations in size. The largest category of farms, or 34 percent, was from 100 to 174 acres, the traditional 160-acre homestead. However, there were thousands under fifty acres, many of them operated by white and black sharecroppers. The large farms, those of more than 260 acres, made up about 14 percent of the total. 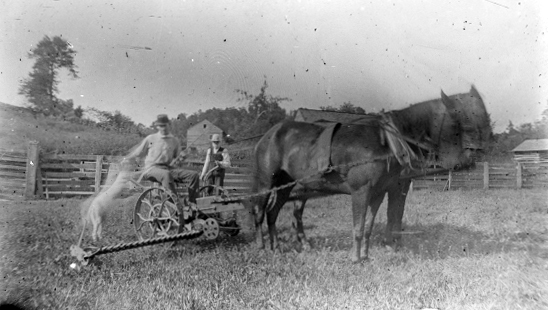 Most of the state's farms were family enterprises in which the operator used horse and mule power to pull their plows, cultivators, and other machinery. A few large wheat farmers were beginning to adopt tractors and combines, but full-scale tractor farming was still in the future. Farm families provided much of their own living, especially outside the main cotton-producing areas, and most of their own labor. Men and sometimes women, as well as children, worked in the fields, milked cows, and did other chores. Women tended gardens, raised chickens, made and sold butter, and marketed eggs. Their work contributed greatly to the economic condition of residents. The federal census of 1920 reported that on the average Oklahoma farm families provided 57 percent of their own food. Oklahoma's 194,000 farmers were just beginning to be exposed to modern conveniences by 1920. Only 4 percent had electricity, 1 percent owned trucks, and 3 percent had acquired tractors to replace or supplement horse and mule power. However, an increasing number of farmers were becoming better connected to the larger world: 25 percent had automobiles, and 37 percent enjoyed telephones. 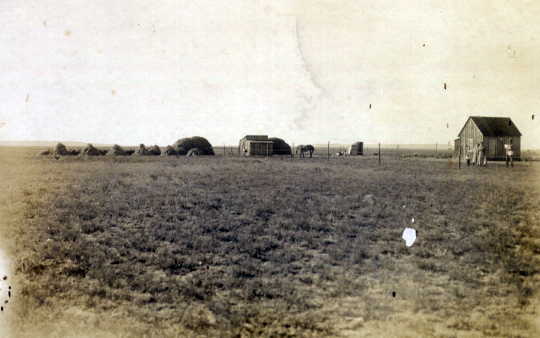 Overall, it was still the horse-and-wagon and dirt-road period of farming in the Sooner State. The benefits of electricity, running water, and indoor bathroom facilities were still nearly a generation away for most. The deflation and severe drop in farm prices that began in late 1920 severely affected all of American agriculture. Oklahoma farmers were among those hardest hit. The prices of cotton, wheat, and livestock, the main sources of agricultural income, drastically dropped. Between 1919 and 1920 cotton prices declined from thirty-five cents a pound to twelve cents; wheat brought only half as much in 1921 as it had in 1919. The cost of things farmers had to buy did not drop in proportion to those of farm prices, which created what the economists called a cost-price squeeze. These conditions intensified a spirit of political unrest and radicalism among Oklahoma farmers who believed that the large corporate and financial institutions had become their oppressors. There had been a substantial number of discontented farmers even before 1907 statehood. Some of them had joined the Socialist Party, which advocated state-operated enterprises such as a state bank and state-owned grain elevators, warehouses, and other facilities that Socialists believed could serve farmers better and at lower costs. Farmers complained loudly about high interest rates, especially those charged to tenants and sharecroppers. In some cases interest rates were as high as 40 percent a year on loans. Many farmers in Oklahoma voted for Fred W. Holt, the Socialist Party candidate for governor in 1914, when the party polled about fifty-two thousand votes. Farmers also joined the Nonpartisan League in 1918 and demanded that the state establish state-owned marketing facilities to help farmers. Given this background of protest, it is not surprising that financially depressed farmers were the most numerous supporters of the Oklahoma Farmer-Labor Reconstruction League, and of Jack Walton, the organization's candidate for governor in 1922. The league's legislative goals called for much the same program advocated by the Socialists. Farmers believed that state-owned enterprises would help their economic situation. While the farm vote helped Walton win the governorship, he was unable to push any of the league's programs through the legislature and was eventually impeached. Farmers were left without any assistance from state government. John A. Simpson, a leader in the Oklahoma Farmers' Union and later president of the National Farmers Union, was the most active and influential farm spokesperson in Oklahoma. Better prices by 1923 and 1924 for both wheat and cotton reduced farm discontent, although life on thousands of Oklahoma farms was a struggle. There were a few good years in the 1920s but also some very bad ones for commercial farmers. In 1925 cotton farmers planted 5.2 million acres of cotton and produced 1,691,000 bales that brought seventeen cents a pound. But the next year a huge crop drove prices down to only nine cents a pound. Wheat prices were also good in 1925, bringing $1.40 a bushel, but within a couple of years it was only a dollar a bushel. In short, the extreme changes in the price of farm crops and livestock were hard on farm income. Moreover, both interest rates and taxes continued to be high. By 1930, 61 percent of Oklahoma's farmers were tenants, and in some counties tenancy was as high as 70 percent. However hard the economic struggle was for farmers in the agricultural depression of the 1920s, the onset of the Great Depression in 1929 and 1930 created even worse conditions. By 1931 and 1932 farm commodity prices had dropped to disastrous levels. The farm price of the huge cotton crop of 1931 fell to about five cents a pound, and wheat brought as little as thirty cents a bushel. Prices of other crops and livestock also dropped. Peanuts, which had become an important crop for some farmers in the southwestern part of the state, declined to as low as $1.60 for one hundred pounds, or about one and one-half cents a pound. The gross income of all Oklahoma farm production, both crops and livestock, dropped from $314 million in 1929 to $115 million in 1932. Under these circumstances, what could farm families do? They had tried to improve their position in the economy in the 1920s by forming agricultural cooperatives. They had sought to increase their efficiency through agricultural mechanization by using more and better production equipment. They had appealed for state and federal help, but nothing had brought any relief. About all the USDA could suggest was for farmers to become more self-sufficient. But, according to one writer, farmers had lowered their standard of living "to an extent reminiscent of pioneer days." Finally, in May 1933 farmers began to see a glimmer of hope through Franklin D. Roosevelt's New Deal when Congress created the Agricultural Adjustment Administration (AAA) and subsequently enacted other legislation to help farmers. Believing that huge agricultural surpluses were responsible for low prices, the AAA provided Oklahoma's cotton and wheat farmers cash benefit payments in return for reducing their acreage. Producers of some other crops also received federal benefits, and programs were implemented to assist hog and cattle raisers. To bring supply and demand into better balance, farmers plowed under a portion of their growing cotton in the spring of 1933. Drought cut wheat production, but farmers received benefit payments if they promised to reduce acreage in 1934. Federal programs also included better farm credit facilities and payment for certain soil conservation practices. Some farmers also received cash from work relief projects. Federal programs were very significant in helping Oklahoma farmers get through the Great Depression. For example, in the fall of 1933 the state's wheat growers received $6,840,000 in cash benefit payments, and cotton farmers realized millions more. Cash payments continued through the 1930s and beyond. Because cash payments to farmers of the main crops were made for reducing acreage, the larger operators benefited most from direct government payments. Small farmers, especially sharecroppers, received little help. This left thousands of small family farmers still struggling to survive. Federal farm programs helped farmers get better prices for their products, but nothing could stop the drought and severe dust storms that struck western Oklahoma between 1933 and 1937. The western and northwestern counties all suffered, but conditions were worst in the Panhandle. The economic catastrophe created by wind, drought, and poor prices caused such distress and financial hardship that thousands abandoned their farms and migrated to California and elsewhere. Many of these migrants left the eastern part of the state as well. The Dust Bowl out-migration was most dramatic between 1935 and 1940 when the number of farms decreased by 33,638. 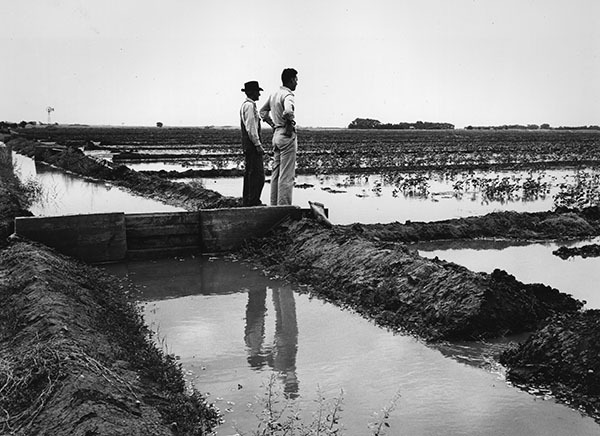 The drought conditions in the 1930s encouraged some farmers in western Oklahoma to turn to irrigation. That area rested on a huge underground aquifer, and by the 1930s deep drilling and pump technology made deep well irrigation practical. A few farmers turned to irrigation before 1950, but land under irrigation expanded quite rapidly in the next thirty years. The highest number of farms in Oklahoma history, 213,325, was recorded in 1935. These figures reflect some return to the farm by town dwellers who wanted to raise part of their own food or who no longer had an urban job. From 1935 onward, however, the number of farms dramatically declined. Even though during World War II both crops and prices were favorable to farmers, by 1950 Oklahoma had only 142,246 farms. Many of the small operators concluded that they could not make a living, or they found better conditions in nonfarm employment. Even somewhat better living conditions could not keep families "down on the farm." By 1950 Oklahoma's farm population was only 25 percent of the state's total, compared to 50 percent in 1920. In the late 1930s living conditions on the farm were beginning a major transformation, largely because the Rural Electrification Administration (REA) was established in 1935. By 1950 about two-thirds of Oklahoma's farmers had electricity. In addition to electric lights, many farm families began to enjoy running water, bathroom facilities, home freezers, refrigerators, electric washing machines, and other conveniences. By midcentury the better-off farmers experienced about the same home conveniences and standard of living as their town and city cousins. By 1950 it was clear that a major restructuring was occurring in Oklahoma agriculture. Farms were becoming fewer and larger as the better-capitalized and more efficient producers expanded by renting or buying more land from departing neighbors. From 1950 to 1980 the number of farms dropped from 142,246 to 72,000, and the average size more than doubled from 253 acres to 481 acres. By 1997, the last federal census of agriculture in the twentieth century, Oklahoma reported a few more farms, but this was caused partially by a change in the definition of a farm. By the 1970s the state's commercial agriculture was concentrated in the hands of relatively few farmers. In 1978 the market value of all farm products sold was $2,367,696,000. Fifty-five percent of that value was produced by only 3,716 farmers and ranchers. These large corporate farms were highly capitalized with huge investments in equipment such as tractors, trucks, grain combines, mechanical cotton pickers, hay balers, and other expensive machines. Farms were significant business enterprises that required not only large amounts of capital but also good management to be successful. In 1997, for example, more than four hundred Oklahoma farmers sold in excess of $500,000 worth of wheat, and 114 of them more than $1 million worth. Thousands of small farmers had become "sidewalk and suitcase farmers"—part-time or hobby farmers—and derived their main income from off-farm work. Of the 74,214 farms reported in 1997, over half, or 41,154, of the operators listed their main occupation as something other than farming. Only 33,060 listed farming as their principal occupation. Whether it was grain or cotton farming, raising peanuts or sorghums, or raising chickens, hogs, or cattle, the operations were mainly in the hands of large operators. By the end of the century most of the hogs and poultry were raised in confined conditions by a few producers. Despite a growing degree of concentration in agriculture, most farms continued to be family owned. But the successful family farms of the 1990s were dramatically different from those in the years before World War II. By the 1990s the annual value of Oklahoma's agricultural production annually ranged between $4 billion and $5 billion. In 1997 the figure was $4.1 billion. Of this amount, crops were responsible for $908 million and livestock and poultry products for $3.2 billion. Wheat had become by far the main commercial crop, leading hay, cotton, sorghums, peanuts, and soybeans by a large margin. By the late twentieth century Oklahoma usually ranked second, third, or fourth in the nation in winter wheat production. While the number of farms and the farm population declined sharply after World War II, agriculture continued to be a major factor in Oklahoma's economy. Farming not only supplied food and fiber for state, national, and world needs, it furnished the raw materials for processing and manufacturing industries that provided consumer goods and nonfarm employment. By 2000 only a very small percentage of Oklahomans lived on farms. However, the historical experiences of farming and farm life have placed an indelible imprint upon the state and its people. The steady decline of the farm population and agriculture's lessening role in the economy have not eliminated the traits and character associated with strong rural traditions. Hard work, honesty, responsibility, neighborliness, a cohesive family life, and practicality are some of the historic farm traits that have been incorporated into the lives of modern Oklahomans. Indeed, the state's farm experiences have left a permanent mark, not only on its economy, but also on Sooner history and culture that will take generations to erase, if ever. Gilbert C. Fite, American Agriculture and Farm Policy Since 1900 (New York: Macmillan, 1964). Gilbert C. Fite, Cotton Fields No More: Southern Agriculture, 1865–1980 (Lexington: University Press of Kentucky, 1984). Gilbert C. Fite, The Farmer's Frontier, 1865–1900 (New York: Holt Rinehart, and Winston, 1966). Donald E. Green, ed., Rural Oklahoma (Oklahoma City: Oklahoma Historical Society, 1977). Richard Lowitt, "Farm Crisis in Oklahoma, Part 1," The Chronicles of Oklahoma 89 (Fall 2011), "Part 2," 89 (Winter 2011-12). Ralph E. Olson, "Agriculture in Oklahoma," in Geography of Oklahoma, ed. John W. Morris (Oklahoma City: Oklahoma Historical Society, 1977). U.S. Bureau of the Census, Census of Agriculture (Washington, D.C.: GPO, 1890–1997). Gilbert C. Fite, "Farming," The Encyclopedia of Oklahoma History and Culture, https://www.okhistory.org/publications/enc/entry.php?entry=FA019.